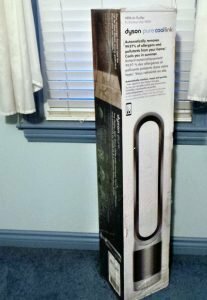 Dyson sent me a Dyson Pure Cool air purifier, to test out and I have to say, this thing is pretty darn cool, no pun intended. The Dyson Pure Cool Link is an air purifier that duos as an air circulating fan. The “Link” in it’s name stands for the fact that it’s linked via wifi to an app, which means you can control it remotely from your tablet or phone. First, it’s one smart cookie. 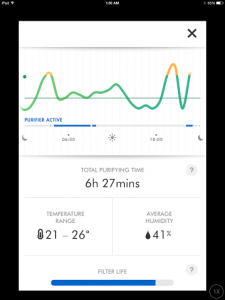 The Dyson Pure Cool Link has sensors to detect the air quality as well as the temperature and relative humidity in the room. The app also draws info from Breezometer to show the local outdoor air quality and BAQI rating. The HEPA filter is designed to capture ultrafine particles (as small as 0.3 microns). It removes 99.97% of allergens from the air, including things like pollen, bacteria and pet dander. 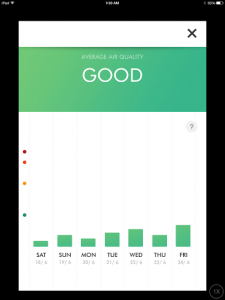 The app stores all this info, so you can go back and look at how your indoor air quality charts over time. You can set a schedule for when it will automatically turn on and off. Using the app you can tell the Dyson Pure Cool Link that you want it to run in auto mode from say 3 p.m. until 7 p.m. each Thursday night when hubby is cooking dinner, or you could tell it to run the fan at level 6 from midnight until 7 a.m. every weeknight to help keep the air flowing in your bedroom while you sleep. It’s light and easy to move from room to room. The entire unit weighs under 4 kilos. The instruction manual warns that you should never carry it by the tower portion. It’s easy to take it apart into two pieces to move it. The tower portion comes off easily and is simple to snap back into place. It has a special night time mode. 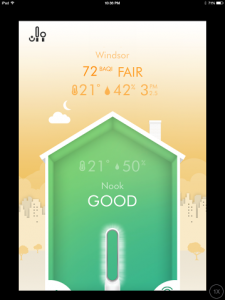 When night time mode is triggered (either via the app or by hitting the moon icon on the remote) the LED display dims and the fan runs at lower, quieter, speeds (maxing out at level 4). It’s a fantastic fan. The tall oval tower “loop amplifier” blows air over a wide area, and it also oscillates back and forth (an option you can toggle on and off, so you can either have it rotating to blow air around the room or stationary and aimed at a precise spot). It has a nice long cord (2 meters long), making it easy to plug directly into a wall socket. It doesn’t take up much floor space. The base has a small footprint, with a diameter of just under 20 cms. You can control the Dyson Pure Cool Link remotely by app. I’m not sure why I would want to be able to turn my air purifier on when I am away from home, but it’s neat that it’s an option. It did come in handy at one point, we went away on vacation for a few days and when I realized I hadn’t turned off the fan before we left I was able to use the app to tell it to turn itself off. 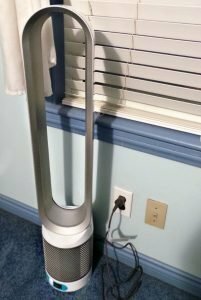 As someone who has allergies to dust, pollen and cat dander, I can say that the Dyson Pure Cool Link has definitely improved the air quality in my home. Using it for close to two months, there’s been a noticeable difference in our indoor air quality, lessening my need to rely on allergy medication to be able to breathe easily while sleeping at night. It’s also shiny. I just like the look of it. 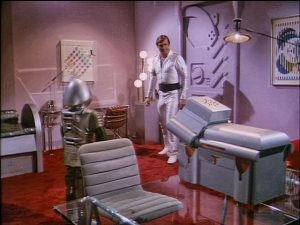 I think it looks like something you’d find in Buck Rogers’ apartment (and yes, I meant that as a good thing). Come on, tell me it doesn’t look like the Dyson Pure Cool Link would fit perfectly right in here? 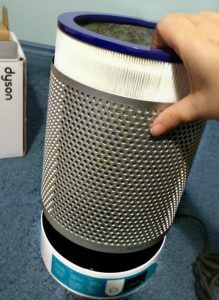 Sneaking a peek at the Dyson Pure Cool Link’s HEPA filter before turning it on for the first time. Overall I am loving our Dyson Pure Cool. It’s become a necessary fixture in our bedroom, and I would love to add a second unit for the ground floor. The price tag is high, but I think this, like all Dyson products, is a case of you get what you pay for. For further info, or to grab one of your own, check out the Dyson webpage. I have been looking at one of these and debating about whether or not to buy one. Thanks for you review, I think I am going to start saving for one. Wow! This sounds wonderful. I like that it turns off when the air is good, and turns on occasionally to check the air quality. Dyson make such good quality products, I would really love one of these! They have good reviews. It would be great to have one. In the past 6 months my son has developed airborne allergies which are affecting the quality of his days. And while it can be controlled with allergy meds, I would love to own a product which actually purifies the air & is safe. The Dyson Pure Cool Link is an awesome product I’d be proud to own. I just love how innovative Dyson is. I am amazed at everything they come out with. 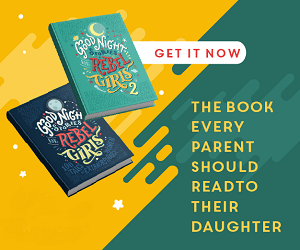 I have my eye on quite a bit of their products already and it seems I should add this to my wish list – it sounds so amazing. What a great machine. I’d love to be able to track the humidity level in our home, as it varies a lot and I worry about mold forming at times. Sounds like this would be a great addition to any house. My allergies can get really bad. Dyson makes some really great products.